Free Shipping Included! WERMA 695.300.55 CleanSIGN WM, 24 VDC, Pa, Green/Yellow/Red by WERMA at In The National Interest. MPN: 695-300-55. Hurry! Limited time offer. Offer valid only while supplies last. Werma CleanSIGN LED stack light signal tower. Use in clean room applications (Fraunhofer IPA approval) and the food industry (EHEDG approval). Werma CleanSIGN LED stack light signal tower. Use in clean room applications (Fraunhofer IPA approval) and the food industry (EHEDG approval). Integrated, high-output buzzer. Measures 485-millimeters length by 112-millimeters width by 125-millimeters height. Fixing: bracket mounting. Colour: green/yellow/red. Sound output: 85dB. Service life: 50000 h (audible: min. 5000 h). Protection rating: IP67/69K. Voltage: 24V DC. Voltage type: DC. Current consumption: 380 mA. Temperature range: -30 degree C to +50 degree C. Tone type: continuous tone. Housing material: PA12. Lens: PA12. 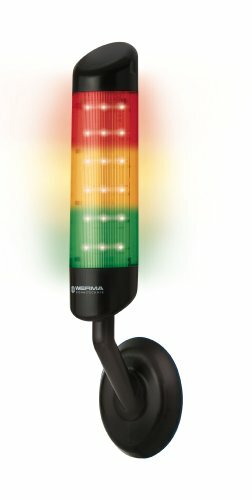 Signal effect: LED Permanent. View More In Tower Stack Lights. If you have any questions about this product by WERMA, contact us by completing and submitting the form below. If you are looking for a specif part number, please include it with your message.